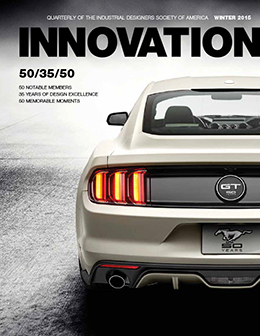 Stay abreast with the latest thinking in industrial design by subscribing to INNOVATION. Deep dive into specific areas of content of interest to industrial designers and other allied design fields once a quarter. IDSA professional members receive a hard copy of INNOVATION as well as online access to the current and previous issues three times a year as a benefit of membership. Student IDSA members receive online access as well to the Spring/Summer and Winter issues and receive a hard copy of the Fall Yearbook of Design Excellence. To receive the latest issues of INNOVATION, please subscribe or become a member of IDSA. To order single issue(s) of INNOVATION please fill out this form. Claims: For missing issues, please send claims to INNOVATION@idsa.org. IDSA will replace up to one magazine per subscription term at no cost to the customer.